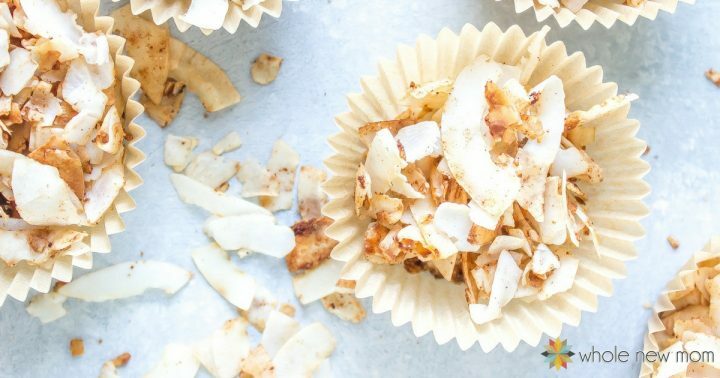 Homemade Coconut Chips have become one of our all-time favorite snacks in our home since I figured out how to make them myself. I had tried the Dang Brand once or twice, and boy were they delicious, but hey–even if you get them at an inexpensive online retailer, they run over $22 a pound!–OUCH! Ain't nobody should be paying that for coconut chips. I just had to (had to, had to, frugal mama had to) figure out how to make them myself. I have a problem. When I see something that is too expensive, or not as healthy as I would like, the wheels start turning and I wonder if I can make it myself. 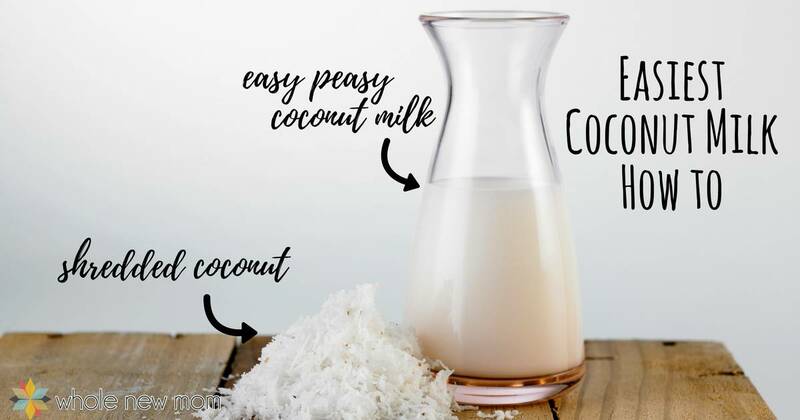 Just like when I decided that I just had to figure out how to make Homemade Coconut Butter and Homemade Almond Milk and Homemade Rice Milk and Homemade Chocolate Chips. When I saw those uber pricey, but still somehow gotta have 'em coconut chips, I figured it couldn't be that hard to recreate them, so I did it–and the result was this Coconut Chip recipe. Once I made my first variety of sweetened coconut chips, I was hooked, and quickly started working on other varieties, which I hope to share with you soon once they are perfected! Well, I just couldn't be happy with one flavor, so I worked on more. I have a few more to share with you later, but today's recipe for Homemade Coconut Chips is perhaps the best yet. At least it's the toasted coconut chip recipe that we make most often :). 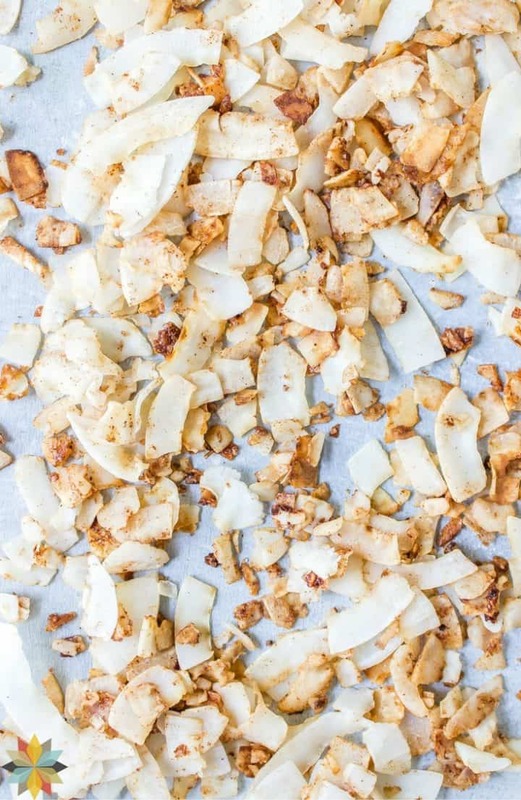 Before we get to the recipe, let me tell you–if you haven't tried toasted coconut chips, you simply don't know what you're missing. Toasted coconut chips are amazing. I think it's because the coconut chips base is sort of like popcorn–they're a great culinary background to paint creatively on. Plus coconut chips are slightly sweet, so if you are making a sweet version, you don't need much sweetener to make them taste great, and they have a very very satisfying crunch when toasted or dehydrated. If you've ever eaten these, you know what I mean. So–here's how this yumminess happened. One day I was on the computer doing work and I saw an advertisement for Gingerbread Spice Coconut Chips. HELLO! COCONUT CHIP FUN FLAVOR ALERT! Well, they looked amazing, but the price sure wasn't amazing. Something like $8 for only 8 oz! So the DIY wheels started turning and I just had to do something to avoid paying $16 a pound for spiced coconut chips! So off to the kitchen I went. The spices in their ingredient list came out of the cupboards, almost like magic, and I went to work. After numerous tries (and a tummy full of coconut chips), I hit on a flavor blend that's just delish. I ended up with something a little different than Gingerbread Spice, but they're better, I think :). Awhile ago, we were invited to a homeschool family Christmas party at a bowling alley. Our group took up the whole place and we were supposed to bring a snack. Typical of our family, we brought our famous popcorn with the Best Homemade Popcorn Seasoning, and it was a hit–as it always is. Seriously, if you haven't tried that popcorn, you need to. After you make these Honey Bunches of Oats® Coconut Chips, that is. This new Coconut Chips recipe was a new fave in our family, however. I hadn't shared them with anyone yet. 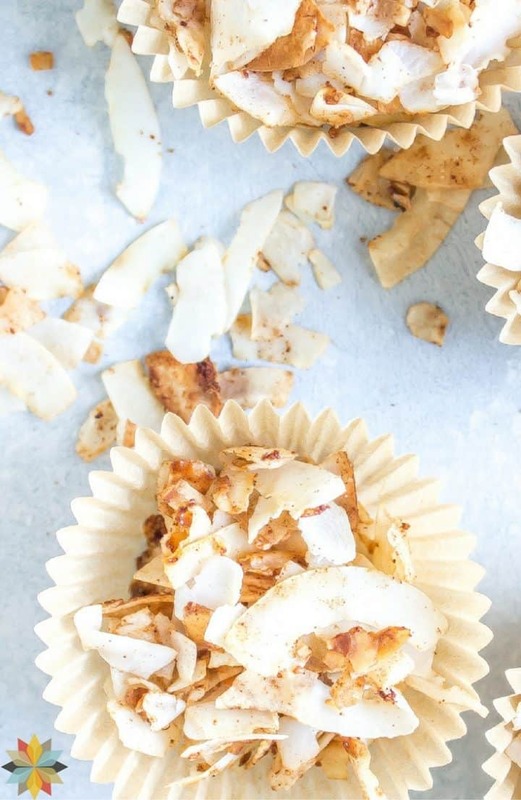 I wanted to bring something lower-carb to the party to help us not overdo the carb thang, so we brought these new homemade coconut chips along too. I wasn't expecting them to be a huge hit with all of the chocolate-covered goodies and all, so imagine my surprise when several moms and kids told me how great they were. One mom came over and said that they tasted like Honey Bunches of Oats. Then, later on, her daughter came over and said, “Oh, those taste like Honey Bunches of Oats!”. I figured that this was just too odd to be something they came up with themselves, so I asked if they had talked about the Honey Bunches of Oats® thing before telling me–but they said no! Imagine that….I'd stumbled on Honey Bunches of Oats® flavor without even trying! Well, the name just had to be. Since that day of bowling with our new homeschooling friends, these Homemade Honey Bunches of Coconut Chips have been with us everywhere. They've been a huge hit as an after-church snack. We typically try to have some kind of healthy snack with us all the time. Due to my son's life-threatening food allergies along with our other sensitivities (plus the fact that I just don't like paying through the nose for food on the run) it's good to be prepared. We've been known to devour quite a few of these coconut chips while chatting after church with friends. And I do mean devour. As in coconut chips gone. Truly, these chips have become quite popular. Way to make me feel good about a recipe I developed :)! There are so many ways to enjoy these bits of yumminess. – Make a Trail Mix! Add in some of these Homemade Chocolate Chips and Soaked Nuts while you're at it! – you can even eat them as a cereal! 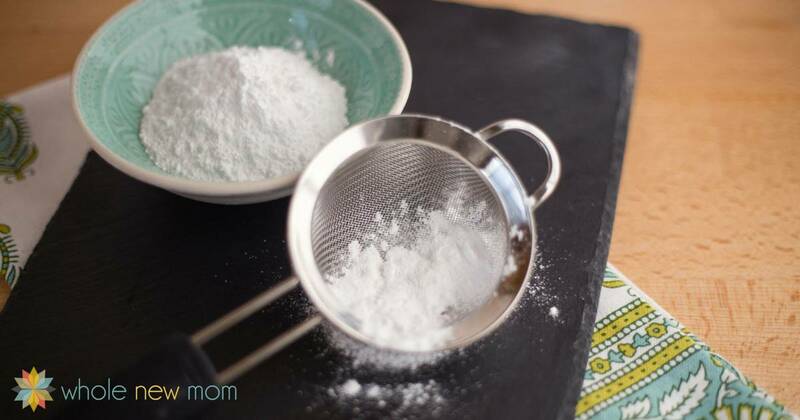 Take a gander at how easy these homemade coconut chips are to make–easy coconut chips peasy! 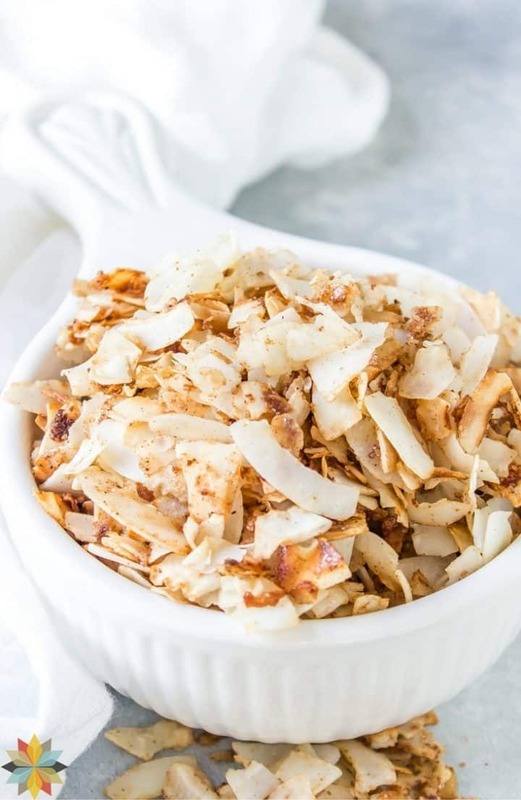 Sweeteners: Xylitol is my choice of sweetener for these toasted coconut chips. It caramelizes beautifully and tastes great! Granulated sugar will work, but in my opinion the resulting toasted coconut chips just aren't as nice. I sometimes use erythritol as well (see Is Erythritol Safe?). It works pretty well, but isn't quite as sweet as the xylitol. Use whatever sweetener works for your diet. AIP: For AIP, substitute mace for the nutmeg. For the allspice, substitute 50% cinnamon and 50% cloves. 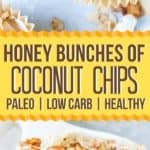 These Caramelized Toasted Coconut Chips taste like the Honey Bunches of Oats popular breakfast cereal and are the perfect healthy easy snack! 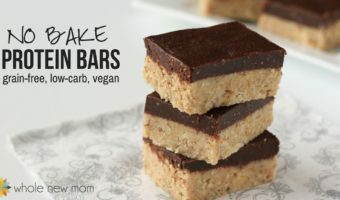 They're sugar free, low carb, keto, vegan, gluten free, THM, AIP. Put all ingredients in shallow pan with a large diameter, if possible. Cook over the lowest heat possible, stirring every so often to prevent burning, until caramelized. Your new favorite easy healthy snack. Can you make this without any sweetener at all? I’ve never cooked with xylitol, but if it behaves like granulated sugar, what can be subbed to get that liquid caramel-y effect? Or maybe add a bit of coconut oil and let that combine with the spices? Hey Tiffany! The xylitol does sort of caramelize in this. I haven’t tried to figure out why but it works! You could make it w/o the sweetener but I don’t think I would like it without. Thanks! I didn’t have any problem with it on the stovetop and especially in the warmer months I prefer the stove to the oven. Hope it works for you and sorry for the delay in responding! What are your thoughts about using honey as the sweetener? (in these as well as the Toasted Coconut Chips) My son with Crohn’s is on the Specific Carbohydrate Diet and the only allowed sweetener is honey. Also…it’s fun to see you are from Michigan – we live in the Kalamazoo area! I think you could do it but I haven’t tried. Maybe try a 1/2 batch? Neat about Kalamazoo! I didn’t grow up here, but one of my H.S. friends went on to Hope College, I think and then lived in Kalamazoo – I thought it was such a crazy name for a town…and now it’s a lot closer to home :)!! Hope it works for you! What do they think about Monk Fruit? Its really an amazing article. I would love to rad more articles like this. I make a pecan chocolate chip granola with coconut chips & cinnamon, have made a walnut cranberry one as well. For me, I found Sukrin Gold brown sugar is what gave me the wow factor. 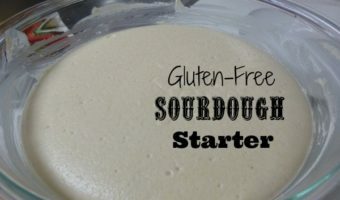 I will have to try a batch of this and see how it compares ! Will give it the hubby taste test as well, as he likes Honey Bunches of Oats ! 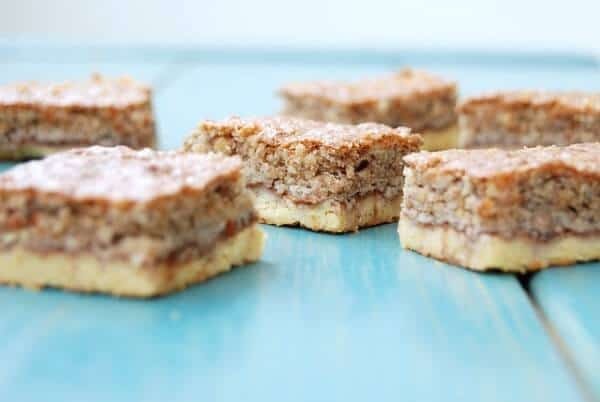 Oooh – yum – just pecans and chocolate chips and coconut? And walnut cranberry and coconut? This sounds amazing…..recipe pretty please :)? I hope you like this!